The International Wire & Cable Symposium and Conference is the the premier technology event for the wire, cable and connectivity industry. The IWCS is an annual event in which the latest technologies in product design, materials, applications and processes are presented in a symposium format. Proton Products Inc. on Booth 104 are available to discuss their revolutionary InteliSENS SL/SLR-W mini Series speed and length sensors. They feature a new optical bench that captures 30% more reflected light from the product. Also, a larger lens size significantly improves both the signal strength and accuracy, to give superior speed and length measurement performance. The new superfast InteliSENS DG-k Series Diameter Gauge is an advanced, solid state LED and CCD instrument with a measurement rate of 10,000 times per axis per second and no moving parts. It is designed for high-speed applications such as insulation and small jacketing processes. Other new Proton Products currently include the InteliSENS ST-HF Series Spark Tester for high-frequency testing. This spark tester permits significant increases in line speed and productivity with complete coverage detection of the wire surface. The InteliSENS LN Series Lump and Neck detector provides high-speed, non-contact optical detection using LED illumination, suitable for line speeds up to 2500m/min on wire drawing, wire and cable extrusion, rewinding and coiling lines. 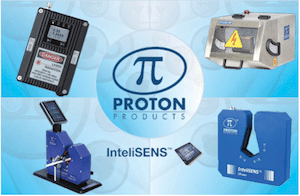 Proton Products InteliSENS instruments include a broad suite of communications protocols and flexible automation capability that are all Industry 4.0 compliant. These fast, accurate measurements with their embedded industry-standard communications and smart technologies form the fundamental building blocks for the successful implementation of Industry 4.0.